How much wear is acceptable on a fork? How often should they receive maintenance? No matter the industry or type of work your lift truck performs, it's important to practice proper fork maintenance and inspect forks on a regular basis. All forks meet or exceed national and international standards - including ISO 2328, ISO 2330, and ANSI B.56. Cascade forks are produced in many section sizes, lengths and mountings. In addition to a full range of fork products for a wide range of industrial and commercial applications, Cascade has the unique ability to customize forks in any size for your application. Cascade also offers a variety of specialty forks, including Inverted Forks, Bolt-On Forks, Spark Resistant Forks, and much more. If you face a special challenge, there's a Cascade fork that can help. 'Cascade produces the highest quality forks available on the market,' says Jason Clarke, Sales Manager in Guelph, Ontario Canada, one of Cascade's global fork facilities. 'Like any tool, their lifespan is going to be affected by the nature of work being done. Consistent maintenance and inspections will assure maximum productivity.' Regular attention to maintenance offers a variety of benefits, including minimized downtime and extended longevity of forks. Cascade's easy guide to fork inspection will help you determine what wear is normal and when to remove a fork from service. Cascade has some helpful resources available to help guide you through this inspection process. The Fork Inspection Guide is available in a variety of languages to make regular fork inspection easy. To order your own hard copy of the guide, complete with a Cascade caliper, visit the Cascade website or reach out to your local representative. Wherever you are in the world, we have a solution for you. 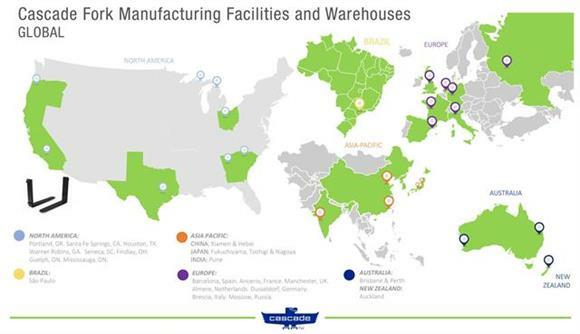 Cascade operates 25 state-of-the-art fork manufacturing plants and warehouses located throughout Europe, North and South America, Asia, and Australia, ensuring the highest quality forks are available to meet the needs of customers all over the world. Warehouses stock over 150 varieties of standard forks for fast shipment on demand. For new fork orders or custom designs, Cascade has the fastest lead times in order to keep your operation running as smoothly as possible. Not only can Cascade help you choose the best forks possible, we're here with the resources to help you maintain them with proper inspection. Contact Cascade today to learn more about forks and fork maintenance. Established in Portland, Ore. in 1943, Cascade Corporation is the global leader in the design, manufacturing and marketing of lift truck attachments, forks and related technologies and a leader in quality attachments for the construction industry. 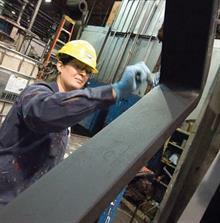 Cascade's unmatched service, support and expertise, combined with advanced damage reduction technologies, flexible manufacturing, short lead times and high-quality products, strengthen the company's position as the premier supplier to the material handling industry. For more information visit www.cascorp.com.